Almo Nature - Cat - HFC Alternative Dry Food is tasty dry food for your cat. This food is made from a single source of meat or fish, so it is also suitable for sensitive cats. The ingredients in this food were originally meant for human consumption. So you can be sure your cat is getting the best cat food! Almo Nature - Cat - HFC Alternative Dry Food is tasty cat food made of 100% HFC ingredients that were originally meant for human consumption. This dry food also only has a single source of meat or fish, making it extra suitable for hypersensitive cats. This cat food is available in an assortment of flavours, such as chicken, salmon, sturgeon, quail and duck. Salmon & rice: fresh salmon 55%, rice, chicken fat, corn gluten, hydrolysed animal protein, yeast, potato, eggs, minerals, mannan oligosacharides 0.2%, inline from cichorei (source FOS) 0.2%. Chicken & rice: fresh chicken 55%, rice, chicken fat, corn gluten, hydrolysed animal protein, yeast, eggs, minerals, salmon oil, cellulose, mannan oligosacharides 0.2%, inline from cichorei (source FOS) 0.2%. Sturgeon & rice: fresh sturgeon 55%, rice, chicken fat, corn gluten, hydrolysed animal protein, yeast, potato, eggs, minerals, beet pulp, mannan oligosacharides 0.2%, inline from cichorei (source FOS) 0.2%. Quail: fresh quail 50%, rice, corn gluten, yeast, chicken fat, beet pulp, potato protein, hydrolysed animal protein, minerals, mannan oligosacharides 0.2%, inline from cichorei (source FOS) 0.2%. Duck: fresh duck 50%, rice, corn gluten, potato protein, chicken fat, yeast, hydrolysed animal protein, beet pulp, minerals, salmon oil*, cellulose, mannan oligosacharides 0.2%, inline from cichorei (source FOS) 0.2%. 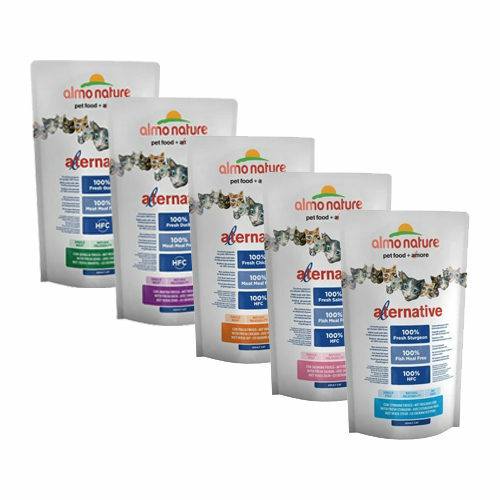 Have you used Almo Nature - Cat - HFC Alternative Dry Food before? Let us know what you think about this product.